Solaria. How would you commute across a large City. In this post I will look at the “MOVEMENT PATTERNS WITHIN AUCKLAND – SELECTED KEY EMPLOYMENT CENTRES” chapter with specific focus on the City Centre (or Central Business District (the CBD)). In subsequent posts I will look at travel patterns for the at the other major employment centres the paper noted. Towards the end of the series I will make an evaluation on the Auckland Plan based on my interpretations from the paper. In short though I can say from reading the paper front to back already the Auckland Plan does need a review at the minimum.  Commuting journeys to the CBD are mainly from the Isthmus and to smaller extent from the southern part of the North Shore.  Increases in trip making to the CBD between 2006 and 2013 have come from within the CBD itself and a number of locations distributed across the Region but without any clear patterns. There have, however, been decreases in trips from a number of areas, including those immediately to the west of the CBD and also to the south of the rail corridor west of Newmarket.  The patterns of commuter trip making to a selection of other major employment centres across the Region have been examined.  For most of these centres commuter trips are drawn from areas further away from the centre of the city and the degree of outbound commuting is limited.  For these smaller centres there is only very limited commuting across the Waitemata Harbour – even for Takapuna which is reasonably accessible to the Harbour Bridge and the Devonport ferry.  For these employment centres the share of private vehicle trips is typically higher than the regional average. To some extent this reflects the nature of employment in these areas and in many cases the lack of public transport services which are attractive to many workers.  Bus use is high in Newmarket and Takapuna/Westlake which are served by major bus corridors. 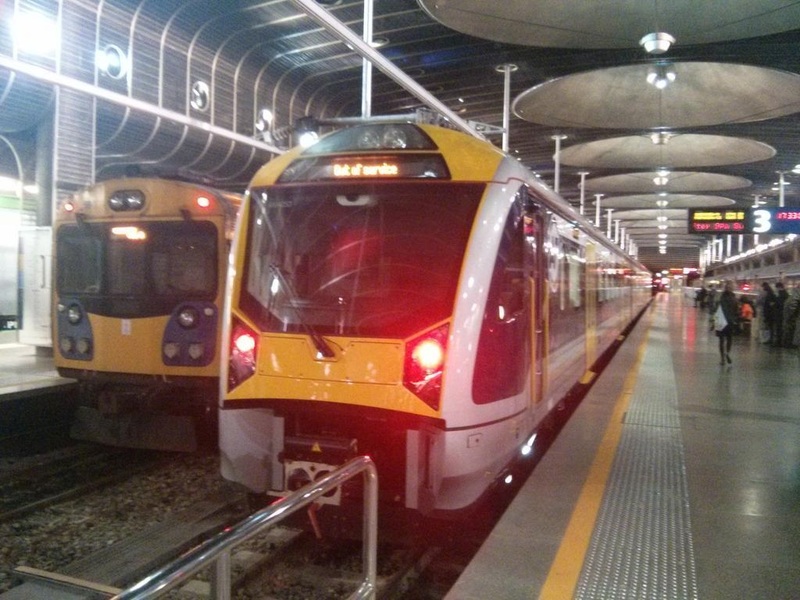  Rail use is higher than the regional average in Newmarket, Henderson and Ellerslie South which lie along the rail corridors, but is low in Onehunga/Penrose which also has a rail connection.  Travel distances are also higher than the regional average for all areas but the difference is small for Newmarket.  Between 2006 and 2013, the public transport share has increased at all the centres except Highbrook/East Tamaki, although in some instances the increase is very small. Commuting journeys to the CBD are mainly from the Isthmus and to smaller extent from the southern part of the North Shore. 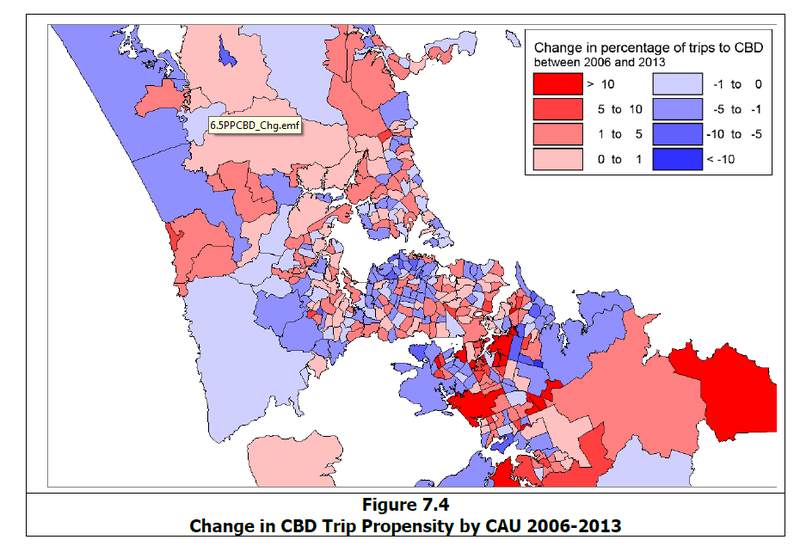 Increases in trip making to the CBD between 2006 and 2013 have come from within the CBD itself and a number of locations distributed across the Region but without any clear patterns. There have, however, been decreases in trips from a number of areas, including those immediately to the west of the CBD and also to the south of the rail corridor west of Newmarket. Between 2006 and 2013, the public transport share has increased at all the centres except Highbrook/East Tamaki, although in some instances the increase is very small. Now these are commuting trips and miss out on tertiary students that can get as high as 125,000 across the Universities, techs, and Private Institutions. For example while the Eastern Line trains are chocker into Britomart, the Southern Line trains are not so chocker at Britomart normally. This is because the Southern Line trains lose most of their commuters at: Penrose, Ellersile and Newmarket before finally getting to Newmarket. So we need to bear this in mind with our transport planning, something AT-HOP should assist with. The share of workers commuting to the CBD as a proportion of the total commuting trips from the area is highest within the CBD itself with a share of 45 per cent or more, and then declines in broadly concentric bands with a proportion of 25 per cent or more from a ring including the CBD fringe. It is noticeable that this ring excludes the North Shore possibly suggesting that the harbour acts as a perceived barrier to travel. Further afield there is an area which has a relatively high propensity to travel to the CBD which lies along the route of the Northern Busway and the Northern Motorway. Interestingly there appear to be no similar impacts along the lines of the Rapid Transit Network (RTN) or motorway south of the Manukau Harbour, although this may reflect the socio-economic characteristics of workers living to the south with lower proportions attracted to the types of jobs in the CBD. Yes and no with Southern Auckland commuting north in lesser numbers owing to socio-economics. I would be more inclined to say Southern Auckland is more drawn to Manukau City Centre and the industrial complexes in the South. 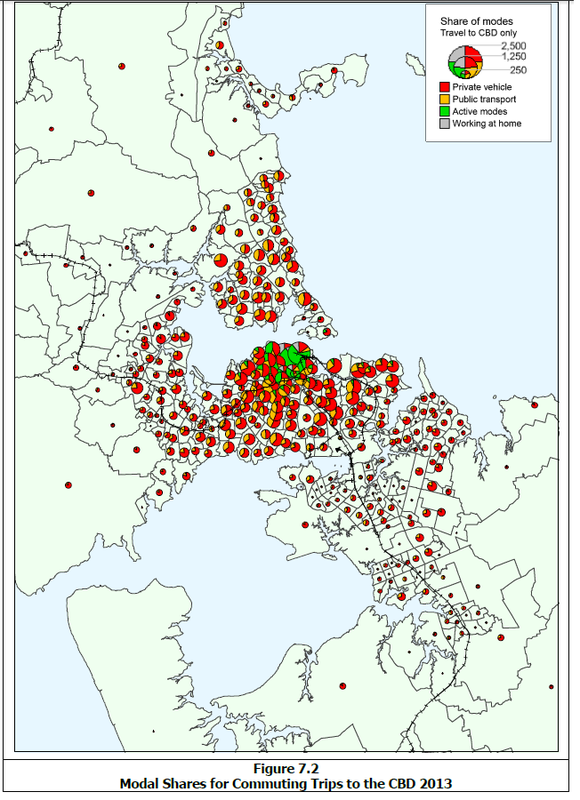 This aspect will be looked at when I analyse Southern Auckland’s employment centres. 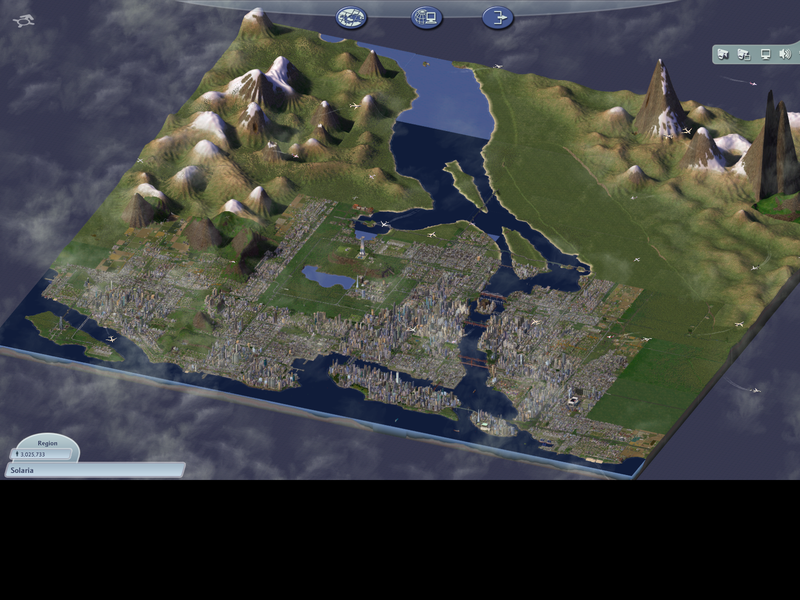 As you can see the bulk the commuting trips to the City Centre stem from the Isthmus (including the City Centre itself) and the lower North Shore. However, you can see other concentrations along the Western Rail Line as far as Henderson and along the North Western Motorway as far the Westgate area. Another concentrations also include the Howick/Botany area (so that plays into socio-economics as mentioned for Southern Auckland) and the areas close to the Southern Line as far south as Papatoetoe. The position displayed in Figure 7.4 presents no clear patterns of change to the CBD with, in general, areas of increases in the shares of workers adjacent to areas of decrease. The only areas where increases coincide with infrastructure improvements is in the corridor between Mt Wellington and Manurewa, which is served by an improved rail service, but in other areas these improvements appear to have little systematic impact on the shares of workers to the CBD. However, as the paper noted “improvements appear to have little systematic impact on the shares of workers to the CBD” – apart from between Mt Wellington and Manurewa (which is served by the Southern Motorway and the Southern and Eastern Lines (which has seen station upgrades and increases in train frequencies). That infrastructure improvements do not necessarily mean more people commuting to the City Centre for work. BUT as I have said the Census does not catch students, off-peak “recreational” travellers, or senior citizens who are not working if the Eastern Line is anything to go by most days of the week (including weekends). That said it does serve as a warning though when committing to infrastructure investment. If we invest say more heavily in rail and buses will the mode share change from private to public transport. My previous post suggests not. The other thing is where are people going? Sure we can invest all this infrastructure to get people to the City Centre but are people going to the City Centre? The Isthmus, lower North Shore and those close to the Western Rail Line or North Western Motorway are but South Auckland for the most part is not.